Wu, C., et al. Proteomics 7(11):1775-1785(2007). Formalin fixed and paraffin embedded human esophageal carcinoma reacted with EXTL3 Antibody (N-term) Cat.-No AP51486PU-N followed by peroxidase conjugation of the secondary antibody and DAB staining. Western blot analysis of EXTL3 Antibody (N-term) Cat.-No AP51486PU-N in MDA-MB435 cell line lysates (35ug/lane). 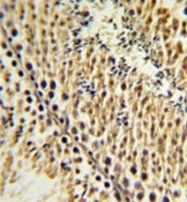 This demonstrates the EXTL3 antibody detected the EXTL3 protein (arrow). Western blot analysis of EXTL3 Antibody (N-term) Cat.-No AP51487PU-N in MDA-MB435, MDA-MB468 cell line lysates (35ug/lane). EXTL3 (arrow) was detected using the purified Pab. 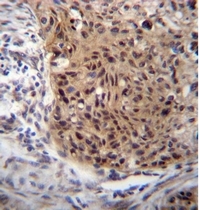 Formalin fixed and paraffin embedded testis tissue reacted with EXTL3 Antibody (N-term) Cat.-No AP51487PU-N followed by peroxidase conjugation of the secondary antibody and DAB staining. 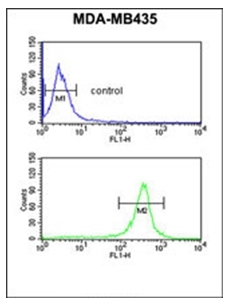 Flow cytometric analysis of MDA-MB435 cells using EXTL3 Antibody (N-term) Cat.-No AP51487PU-N (bottom histogram) compared to a negative control cell (top histogram). FITC-conjugated goat-anti-rabbit secondary antibodies were used for the analysis.